Home :: Gold Nugget Gallery :: Gold Crystal Specimen Shaped Like a Samurai Warrior. 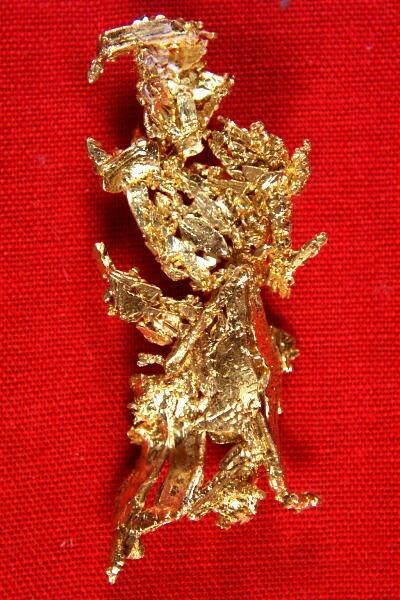 Gold Crystal Specimen Shaped Like a Samurai Warrior. Wow! 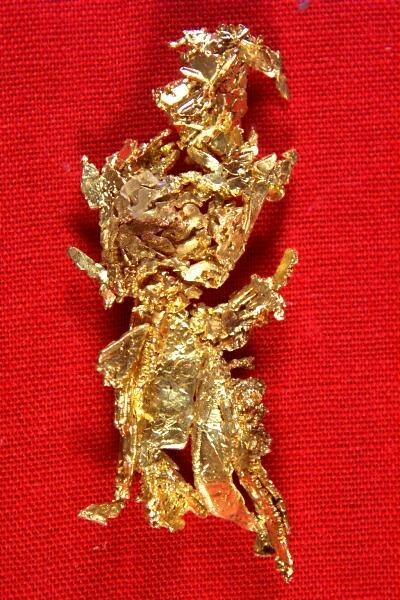 This incredible gold specimen looks like a samurai warrior. You can see the whole body shape, head, body, legs, feet, with various sword handles and blades in scabbards. From the famous Eagles Nest Mine in Placer County, California, this amazing gold crystal specimen truly belongs in a museum. It has spinel twins along with wire gold and interlaced elongated crystals. I can even spot a trigon and the top of a cube in the first photo under the head and a bit to the right. Very cool! The weight of this gorgeous gold specimen is 6.6 Grams (102 Grains) and the size is 1.2" x 5/8" x 3/16". It comes with a plexiglass holder for displaying. It has much more intricacy and detail than the photographs can show. You will be amazed by this spectacular gold specimen.